Kashmir has been rattled by widespread mob violence and clashes which left 15 people dead and 126 injured, including 96 security forces personnel, even as curfew was clamped across the Valley. Mobile internet services were suspended to contain the fallout of gunning down of militant commander Burhan Wani. 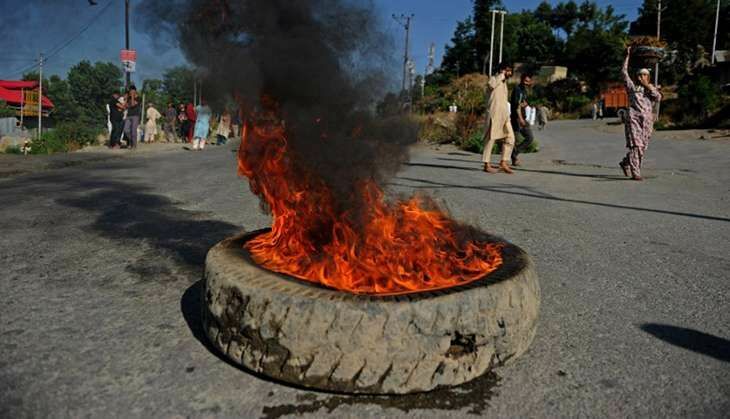 A top official said curfew has been imposed across the Valley and restrictions put in place to avert fresh trouble. Three policemen were also missing after a large mob attacked a police station, set it ablaze and used its weaponry to shoot and injure three cops, police said. Amid the protests, militants attacked a police station in Pulwama, which was thwarted by the security forces. In view of the volatile situation, the Amarnath Yatra was also suspended, with police saying it will be resumed "as soon as it is possible to ensure security of yatris". Chief Minister Mehbooba Mufti appealed for calm while expressing "profound" grief and agony over the deaths during the protests and asked security forces to avoid the use of disproportionate force for crowd control. Union Home Minister Rajnath Singh said Centre is working with the state government to bring normalcy in the Valley. He also expressed "deep anguish" over the "loss of precious lives in the incidents of violence" in Kashmir and appealed for calm. As Burhan, the 21-year-old poster boy of Hizbul Mujahideen militant outfit, was laid to rest in his native place Tral, violent mobs attacked installations of police and paramilitary forces at various places in the Valley and set ablaze several buildings including three police installations, as a result of which three cops were missing. Burhan's funeral was attended by thousands of people. There was no deployment of security forces in Tral and adjoining areas to avoid a confrontation with the people coming to participate in the funeral. "We have had a very difficult day today," said ADGP (CID) of J&K Police SM Sahai while describing the situation "bad in certain segments", "not critical" in areas like north Kashmir and under control in Srinagar. Eleven people were killed in the clashes between violent protestors and security forces at various places in the Valley that erupted a day after Burhan's killing. Eight were killed in "retaliatory" action by security forces, Sahai said, adding one person died due to drowning. "It is very unfortunate that young lives were lost in clashes," Sahai told reporters and appealed to the parents to restrain their children from participating in such protests so that young lives are not lost. The militants are trying to "superimpose their attacks" on public protests, he said, while informing that there was also a militant attack on District Police Lines in Pulwama which the security forces thwarted. To a volley of questions, including why Burhan was gunned down and not caught alive, Sahai said, "We certainly don't want to kill youngsters of our own society." He said the Hizb commander and two others got killed when security forces retaliated after being fired upon by the trio from a house in which they were hiding. Two security personnel were injured in that firing, he added.